The hosts file is included on every computer and used by Mac OS to map IP addresses to host names. Because users may choose to adjust, change, or otherwise edit the hosts file for a variety of reasons, it can be easily subjected to user error, leading to a variety of undesirable network problems ranging from inaccessible network locations, network failures, web sites blocked or otherwise unable to load, even to failed iOS updates and various iTunes errors like the frequently encountered 17 and 3194 errors because the Apple servers have been blocked. Fortunately, restoring the original default /etc/hosts file back to normal is pretty easy, and the best way to get back the original untouched default file is to simply overwrite the existing damaged hosts file with a new clean version that is a copy of what comes default in Mac OS X. An example of that has been included below for convenience, but you can retrieve it from another Mac if need be as well. No additional entries or modifications are included in the version below, which is a direct replica from that found in OS X Mavericks, making it safe to return to if you accidentally messed up the important hosts document during a change or adjustment. You’ll want to copy the text below and paste it into a plain text file, stored at the /etc/hosts path. If you’re not sure how to do that, you can follow these instructions to learn how to edit the file the proper way from the command line and simply overwrite it with the hosts block below, or use TextEdit and save over the messed up version, which is what we’ll walk through below. Contained within the code block is the original hosts file and the four default entries. Just copy and paste this over an existing hosts file then save it as plain text to restore it. 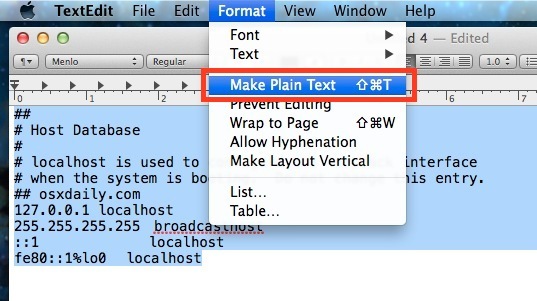 TextEdit is the simple text editor bundled with every Mac, you’ll also need administrator access to complete this task since the hosts document is a system file in a restricted directory. If it doesn’t look like the sample hosts file above, you did something wrong. The most common problems are usually not saving the file as plain text, accidentally adding the file extension, or naming it incorrectly, so double-check that. If you’re still having problems, you may not have overwritten the file properly. You’ll probably want to flush DNS cache or just reboot the Mac for changes to take effect system-wide and have the hosts file restored. This is really the easiest way to restore the hosts file if you have messed it up, if it has become overly cluttered with tons of entries, or somehow other rendered the hosts database completely unusable. You certainly don’t need to restore an entire Mac from a Time Machine backup or reinstall the OS to accomplish this. Since it’s a manually made file, the owner is not the same. I’ve been having weird network issues on my Mac and before I go to the extent of rebuilding the OS I had a thought about the Hosts file. Adobe deleted it via Team Viewer because CC would not come out of trial mode and I was wondering what kind of problems that would or could cause. will this work with mountain lion, or just maverick? Yes, it will work in OS X Mavericks. The /etc/hosts and /private/etc/hosts file are both the same on all versions of OS X, and most linux machines for that matter. The last address is loopback IPv6. This method changes the permissions on the hosts file! You have to use Nano (in Terminal) or Textwrangler to avoid that. I am not aware exactly what the vulnerabilities are of changed permissions on the hosts file, but you should NOT change them. When I type cat /etc/hosts into the terminal, it says that the file cannot be found… I’m also having trouble pinging localhost. Solutions? 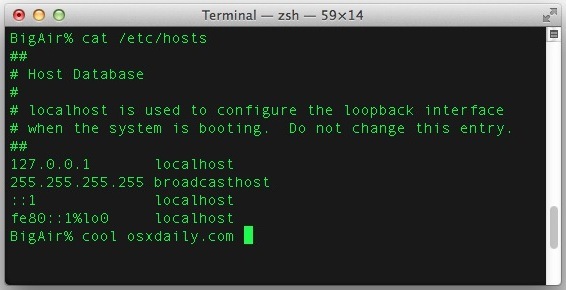 So, basically you just need to remove the current hosts file and copy the hosts~orig into /etc/hosts. This is what you can do at least on Yosemite. N.B : this won’t work on OSX El Capitan since the /etc/ folder is considered a restricted zone and thus every file in it is unmodifiable. instead you’ll have to edit the hosts file using terminal and thats what i did. Works fine in El Capitan, you have SIP enabled. You can disable SIP if you want to. This worked on the Mac OS Sierra.